The National Parks Service is facing a new threat, and it’s not a wild horde of honey badgers. It’s living slime. 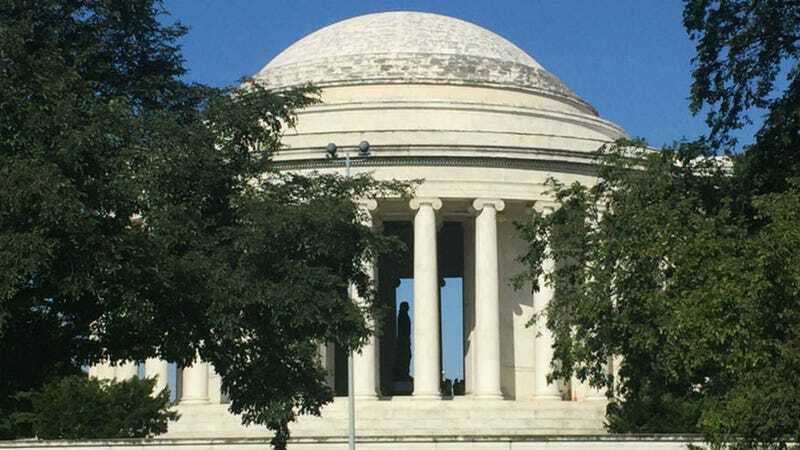 The organization released a statement on Wednesday that explained the gray stuff taking over the top of the dome on the Thomas Jefferson Memorial isn’t mold or dirt, but biofilm: a group of microscopic organisms. It’s actually been spotted on a number of Washington, D.C. landmarks, such as the Lincoln Memorial, and officials are unsure as to where it comes from. Biofilm can form any where microorganisms can attach to a surface, either on their own or with the help of earlier organisms, often being attracted to moist surfaces. According to the Center for Biofilm Engineering at Montana State University, within moments of attaching to a surface, they start producing slimy extracellular polymeric substances, which gives the slime its shape. After reaching maturity, the biofilm will spread, whether by detachment of slime clumps or by dispersal, as seen in the chart below. It’s unclear what effect the biofilm is having on the monument, since it normally isn’t made up of one type of organism and it doesn’t have a specific class alignment. Some biofilms are bad, such as dental plaque, but some have some positive uses, according to Popular Science, such as the ability to clean up artwork. Officials first noticed the slime on the memorial in 2006 and have been closely monitoring it since 2014. What Parks staffers understand about biofilm is that it needs a place to grow with plenty of nutrients, and often is found on stone. The dome on the memorial used to be smooth, but has eroded over the years, providing plenty of cracks for the slime to spread. Therefore, researchers don’t have a set treatment plan, although it is possible to treat (a case of it was treated at the D.C. War Memorial in 2011). The Parks Service has recently began testing ten different chemical biocides on small patches at the memorial to see how they’ll be effected. It also plans to use non-traditional methods, such as irradiation with lasers, if need be. In the meantime, you can look up and enjoy the fact that the major plot point in Ghostbusters II has a little scientific weight.